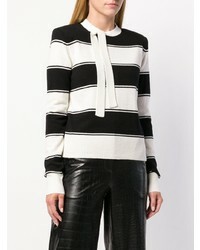 If you're looking for a casual yet chic look, try teaming a Marc Jacobs horizontal strip sweater with navy jeans. Both garments are totally comfy and will look fabulous paired together. Bring instant interest and excitement to your look with black suede pumps. 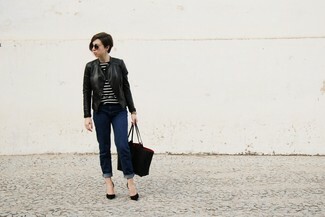 If you're hunting for a casual yet totally chic getup, opt for a Marc Jacobs horizontal strip sweater and navy skinny jeans. Both items are totally comfy and will look fabulous together. 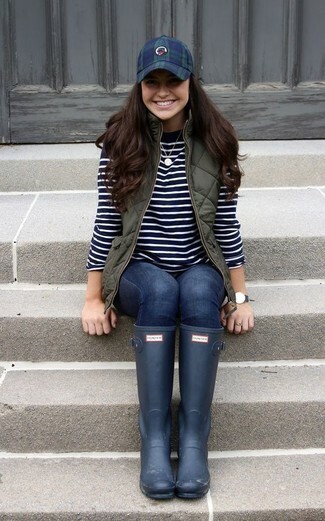 Go for a pair of navy rain boots to have some fun with things. If you're a fan of relaxed dressing when it comes to fashion, you'll love this chic pairing of a Marc Jacobs horizontal strip sweater and black ripped skinny jeans. Rocking a pair of black leather ankle boots is a simple way to add extra flair to your outfit. 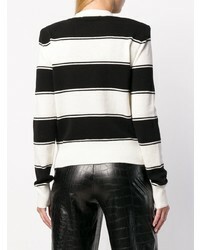 If you're looking for a casual yet chic getup, dress in a Marc Jacobs horizontal strip sweater and black skinny jeans. Both pieces are totally comfy and will look fabulous together. When it comes to footwear, this getup is complemented nicely with black suede low top sneakers. If you're all about comfort dressing when it comes to fashion, you'll love this super cute pairing of a Marc Jacobs horizontal strip sweater and a black skater skirt. To add oomph to your getup, finish off with black leather ankle boots. 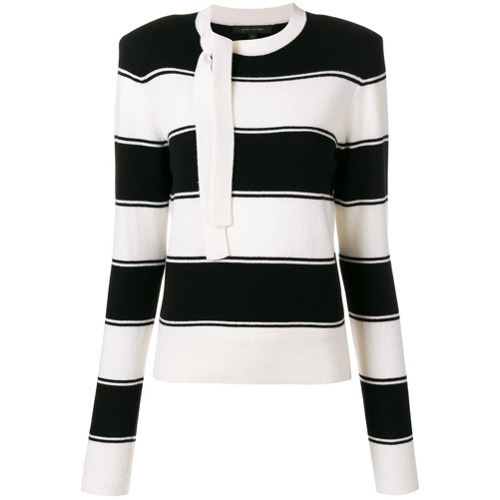 If you're all about comfort dressing when it comes to your personal style, you'll love this extra cute combination of a Marc Jacobs horizontal strip sweater from farfetch.com and a black mini skirt. Bring a touch of sophistication to your look with black suede ankle boots. If you're searching for a casual yet chic outfit, reach for a black and white horizontal striped crew-neck sweater and white shorts. Both garments are totally comfy and will look fabulous together. When it comes to shoes, this look is round off perfectly with grey leather boat shoes. If you're on a mission for a casual yet stylish getup, try pairing a Marc Jacobs horizontal strip sweater with black floral skinny pants. Both garments are totally comfy and will look fabulous paired together. Make your getup more fun by finishing off with black leather lace-up flat boots. If you're obsessed with practicality dressing when it comes to fashion, you'll love this absolutely chic pairing of a Marc Jacobs horizontal strip sweater and a tan leopard skater skirt. You could perhaps get a little creative when it comes to footwear and elevate your outfit with black suede pumps.